The global hybrid vehicles market has been gaining momentum over the past few years as vehicles available in this market are known to have a sophisticated performance. Hybrid vehicles operate without separate alternators and engines and usually have multiple combined motor or generators, which is used for starting internal combustion engine. These motor and generators deliver a better performance as compared to others, making hybrid vehicles superior as compared to conventional ones. Furthermore, the fact that pure hybrid vehicles are emit lesser carbon dioxide and are environment friendly is also driving the growth of the global market. Owing to these reasons, the global hybrid vehicles market is expected to be worth US$193.29 bn by 2024 as compared to US$75.52 bn in 2015. Between the forecast years of 2016 and 2024, the global market is estimated to expand at a CAGR of 10.3%. The report states that the demand for hybrid vehicles will rise against the backdrop of rising concerns pertaining to pollution. The shocking rise in air pollution and its adverse effects on human health and the environment has coaxed governments and the consumers to opt for environment-friendly vehicles. Furthermore, the soaring fuel prices has also augmented the demand for pure hybrid, pure electric hybrid, and battery driven hybrid vehicles across developed regional of North America and Europe. Though the demand for hybrid vehicles seems to be consistent, the market is likely to face a few tough challenges on the way. The high cost of research and development of hybrid vehicles is seen to be percolating to the selling price, which is discouraging several end users from making purchases. Furthermore, the skepticism surrounding the usage of hybrid vehicles amongst end users is also likely to hamper the growth of the overall market in the coming years. On the basis of type of vehicles, the global hybrid vehicles market is segmented into passenger vehicles, light commercial vehicles, and heavy commercial vehicles. Of these, the passenger vehicles segment is expected to grow at a significant pace in the coming years due to the high demand for passenger vehicles across the globe. Furthermore, the introduction of technologically advanced passenger vehicles that are eco-friendly and are powered with sophisticated engines is expected to shape the trajectory of the overall segment in a positive manner in the coming years. In terms of geography, the global market is segmented into Asia Pacific, North America, Latin America, Europe, and the Middle East and Africa. Of these, Asia Pacific is expected to lead the pack. This regional market will be driven by the booming automotive industry in the region and the growing investments by foreign companies in the emerging economies. The Asia Pacific hybrid vehicles market is likely to be fueled by the improving disposable incomes of rising nations such as India and China. Changing lifestyles, higher fuel prices, and increasing awareness about benefits of hybrid vehicles is also expected to have a positive impact on this regional market. Key players operating in the global market are General Motors Company, Bayerische Motoren Werke (BMW) AG, Ford Motor Company, Audi AG, Mercedes-Benz USA, LLC, Hyundai Motor Company, Toyota Motor Corporation, MAN SE, Nissan Motor Co. Ltd., and Renault SA. This market research study analyzes the hybrid vehicles market on global basis and provides estimates in terms of revenue (US$ Bn) from 2015 to 2024. It describes the market dynamics affecting the industry and analyzes their impact through the forecast period. Moreover, it highlights the significant opportunities for market growth in the next eight years. The market is segmented on the basis of geography into Europe, North America, Asia Pacific, Middle East and Africa (MEA), and Latin America. Thesesegments have been estimated in terms of revenue (US$ Bn). In addition, the report has been segmented based on engine type, which includes, hybrid electric-petroleum vehicles, continuously outboard recharged electric vehicle (COREV), hybrid fuel (Dual Mode), fluid power hybrid and others. By vehicle type the market is categorized into passenger vehicles, light commercial vehicles and heavy commercial vehicles. 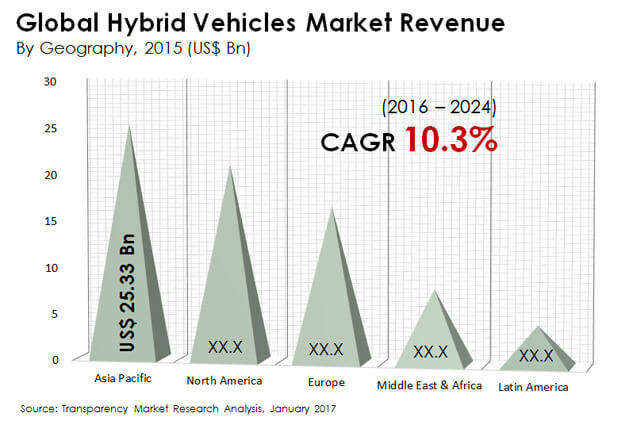 For better understanding of the hybrid vehiclesmarket, the study comprises market attractiveness analysis, where vehicle types are benchmarked based on their market scope, growth rate and market attractiveness. The hybrid vehicles market is consolidated as there are few hybrid vehicle manufacturing companies among which Toyota holds majority of the market share in the world. Competitive rivalry is projected to be high among key players to acquire higher share of the market in the coming years. Hybrid vehicles uses two or more sources of power for its functioning such as internal combustion engine along with an electric motor. Due to high pollution created by conventional vehicles run on gasoline and diesel, there has risen a need to search for alternate sources of energy which are environment friendly in nature. Hybrid vehicles are eco-friendly, which consume less fuel or power and create low emission. Such vehicles can also be run on gasoline and diesel apart from its primary electric motor or battery. Gasoline hybrid vehicles are witnessing growing demand in the North American and European market because of its superior performance and low pollution. Moreover, diesel hybrid vehicles are expected to witness a larger growth in the Asia Pacific and African regions, considering its high fuel efficiency. The global hybrid vehicles market is consolidated where few market players hold majority of the market share. Entry into this market is not restricted as there is no monopoly of business and the market has huge scope and opportunity. However, setting up of manufacturing units for hybrid vehicles require huge capital and resource, which is not feasible for most of the small and medium sized companies.Increasing private equity investments and merger and acquisitions of companies in the automotive sector has been of great influence to the hybrid vehicles market. Significant growth in the automotive sector coupled with economic reforms in major developing countries has been able to bolster the growth of this market. Asia Pacific, Middle East and Africa, and Latin America are key markets for the future and are expected to provide huge opportunities to the global hybrid vehicles manufacturers because of the growth in the automotive sector and rising demand for energy efficient and environment friendly vehicles. Key players in the global hybrid vehicles market have been profiled and their company overview, financial overview, business strategies and recent developments have been covered in the report. Major market participants profiled in this report include: General Motors Company, Bayerische Motoren Werke (BMW) AG, Ford Motor Company, Audi AG, Mercedes-Benz USA, LLC, Hyundai Motor Company, Toyota Motor Corporation, MAN SE, Nissan Motor Co. Ltd., and Renault SA. The report provides a cross-sectional analysis of by engine type segment and by vehicle type segment with respect to the above mentioned regions.